This 43,000 square foot, state-of-the-art aquatic facility features a 50-meter by 25-yard main pool and an additional small therapy pool, a diving well, locker rooms and shower facilities. A large mezzanine gives spectators a bird’s eye view of the swimmers below. The national award-winning design of the facility was completed in 1996 and was part of the renovation of South Side High School. It was made possible by a bond levy supported by the Fort Wayne community. Located adjacent to South Side High School, the pool is used by all FWCS students, families and patrons, as well as the entire community. The pool features both 1- and 3-meter diving boards. The depth of the pool ranges from 4 feet at the east end to 12.5 feet under the diving boards on the west end. The pool features 23 usable short course lap lanes or 8 long course lanes, along with a movable bulkhead. The Daktronics Timing system is used for competitions. The Helen P. Brown Natatorium staff is committed to going the extra lap to ensure safety at the facility. Features include rigorous training required of lifeguards, state-of-the-art technology to enhance safety measures and stringent licensing standards that must be met every day. Because safety at the Natatorium is the number one priority, we have partnered with the leaders in the industry in aquatic safety. All lifeguards are trained through the International Lifeguard training program. Lifeguards who successfully pass the class are licensed. Licenses help keep staff accountable for maintaining test-ready skills. Unannounced audits of the facility and staff to ensure competence and maintenance of standards. Poseidon Technologies has created the world’s first and only computer-aided drowning detection system. It was installed at the Helen P. Brown Natatorium in the Fall of 2001. The Natatorium was the first 50-meter pool in the world and the second school pool in the world to have this state-of-the-art technology. The Poseidon system uses computer vision technology to provide constant surveillance of the pool and monitor the trajectories of swimmers. This sophisticated device analyzes activity in the pool captured by a network of cameras mounted both above and below the surface of the water. The system alerts staff via a beeper and monitor when a swimmer is motionless below the surface of the water for up to 10 seconds. The system gives lifeguards the exact location of the incident - saving precious seconds that could save a life. 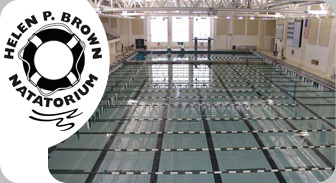 The Natatorium was named to provide a lasting tribute to Helen P. Brown, a long-time advocate for children and member of the Fort Wayne Community Schools Board of Trustees beginning in 1973, including two terms as president. Helen P. Brown’s work with Parents for Quality Education with Integration resulted in significant changes in the system of education in the city, including the end of racial isolation in the FWCS elementary schools.